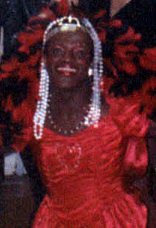 A Gender Variance Who's Who: Marsha P. Johnson (1944 - 1992) activist, drag mother. Marsha P. Johnson (1944 - 1992) activist, drag mother. Malcolm Michaels, Jr. grew up in Hoboken and Elizabeth, both in New Jersey. Malcolm would transform to Marsha on the commuter train into New York. In 1966, Marsha moved to Manhattan for good. She was well-known in New York drag and arts scenes from the 1960s to the 90s. Sometimes she worked as a waitress, but usually she worked the streets. She was known for helping other transvestites and street people, was regarded as a drag mother, and in particular was a mentor to the young Sylvia Rivera. She panhandled and was often on roller skates. She was deeply religious and had visions. In the early days she was known as Black Marsha, but then dropped the ‘Black’, and became Marsha P. Johnson. The P. as she loved to explain, including on one occasion to a judge, stood for “Pay it no mind”. The judge laughed and let her go. She participated in the Stonewall riots in 1969, where she was observed dropping a heavy weight onto a police car. She was co-founder with Sylvia of STAR (Street Transvestite Action Revolutionaries) and was active in STAR House which attempted to feed the homeless and the street transies. She was also a performer and a member of Hot Peaches, and did a London tour with them. She never got a female passport, and had to do male drag to go through immigration. She was photographed by Andy Warhol. By 1979 she acknowledged several attempts on her life by johns, eight nervous breakdowns and innumerable arrests – after one hundred she stopped counting. Marsha was rightly regarded as generous through the decades, but when Malcolm took over he could be quite nasty, and might even pick a fight with someone who said hello to him. Marsha was probably murdered: her body was found floating in the Hudson River shortly after the 1992 Pride March, but the police declined to investigate. Antony Hegarty’s band, Antony and the Johnsons, is named in tribute to Marsha. Bob Kohler. “Rapping with a Street Transvestite Revolutionary: An Interview with Marcia [sic] Johnson” in Karla Jay and Allen Young. Out of the closets: voices of gay liberation. New York, Douglas Book Corp. 1972. New York : Pyramid Books, c1974. New York: Jove Publications, 1977. Martin B Duberman. Stonewall. New York : Dutton, c1993. New York: Plume, xix,330 pp. 1994: 67-8,188,190,191,192, 204,235,237,251-5,259. Julian Fleisher. The Drag Queens of New York: An Illustrated Field Guide. New York: Riverhead Book. 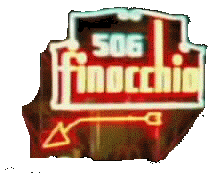 1996: 35-6, 39,59-62. Leslie Feinberg. Transgender Warriors: Making History from Joan of Arc to Rupaul. Beacon Press, 1996: 130-1. David Carter. Stonewall : the riots that sparked the gay revolution. New York : St. Martin's Press 2004. New York: Griffin 2005: 61, 65-6,162,188, 261. Susan Stryker. Transgender History. Seal Press. 190 pp 2008: 86. Amy Coleman. “The legendary Marsha P.Johnson…The Queen Mother”. www.amy-coleman.com/cab.htm#marshap. Michael Kasino (dir). 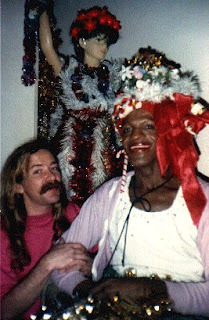 Pay It No Mind: Marsha P. Johnson, with Marsha P. Johnson, David Carter. US 54 mins 2012. I was befriended and guided by Marsha. I was fourteen when we met on Christopher Street in 1972. Just a few short years ago, there was virtually no information on her, so I thank you on behalf of her friends for this tribute. The most interesting thing is, I hadn't yet seen mentioned anywhere that Marsha would fume if she were called Marsha when Marshall was in control. I thought I had made that up? I wonder if it will be noted anywhere that there were just as many gays who hated her as loved her during this time, 1972-1974? We cannot gloss over the truth. I will leave you with a quote from Marsha that has stood me well for all these years. "I don't take anything personal, personally!" Ha!